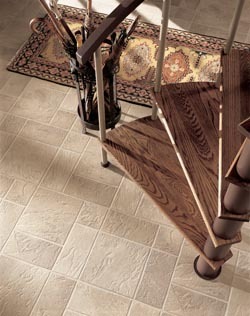 Upgrade your home’s outdated flooring with luxury vinyl flooring in Downingtown, PA. Replacing your old, run-down carpets or laminate floors with top quality luxury vinyl tile or plank flooring is a great way to boost the style as well as the real estate value of your home. Visit our flooring showroom to peruse our wide selection of luxury vinyl plank and tiles and be sure to schedule luxury vinyl flooring installation with our team of skilled professionals. If you’re not sure which style or format of luxury vinyl flooring best suits your home, feel free to discuss your needs with our knowledgeable sales and design professionals. We’ll show you a variety of samples based on your preferences and help you narrow down your choices until you find the perfect flooring style for your house. While vinyl flooring has been around for a while, it’s recently improved its appearance, texture, and durability significantly. With advances in manufacturing methods and materials, luxury vinyl flooring has become a very popular flooring choice for homes and businesses everywhere. Because LVF is a human-made material, it can be manufactured to mimic any material including natural stone, ceramic tile, hardwood planks, or any pattern or color you desire. Its water resistance makes it perfect for any room in the house, and you can rest easy knowing that it won’t require intensive maintenance needs like steam cleaning or grout scrubbing. What do you want your flooring to look like? At our showroom, we carry a wide range of luxury vinyl tile or vinyl plank flooring so we are sure to be able to match the style you’ve got in mind. From the rich tones of exotic hardwood species to the light elegance of marble tile, luxury vinyl is available in many styles to suit every need. Once you’ve chosen your perfect style for your remodeling or renovation project, be sure to protect your investment by allowing our team to handle your luxury vinyl flooring installation. We use the most reliable installation equipment and methods to ensure your flooring is installed properly and securely. By leaving the installation to us, you know your new floors are sure to look and perform well for many years. In addition, you’re covered by our Lifetime Installation Guarantee – if any installation-related issues occur throughout the lifetime of any floor installed by us, we’ll make it right at no cost to you. Contact Us to learn more about our wide selection of waterproof flooring. We’re proud to serve clients in Downingtown, Coatesville, Honey Brook, Chester Springs, Lionville, and Exton, PA, as well as the surrounding areas.